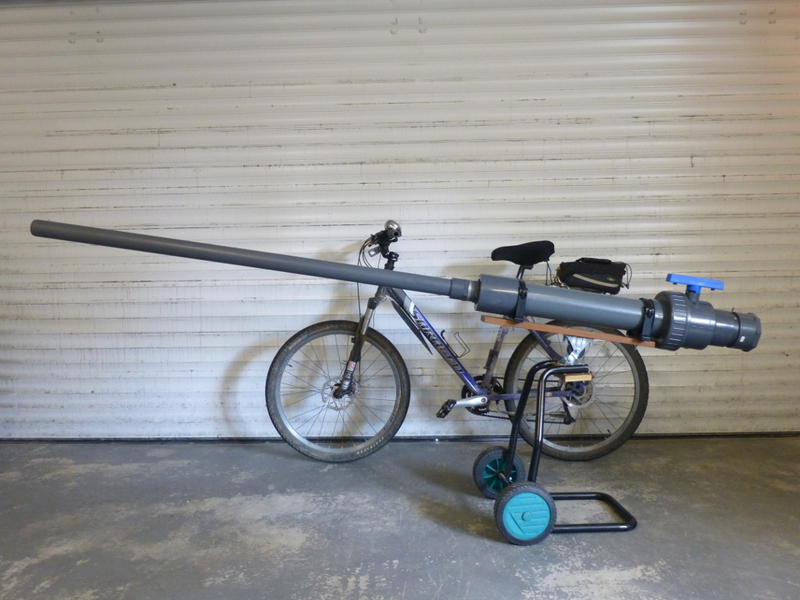 Built in April 2014, by Simon Murton, this potato gun had a range of 300 metres. The Saracen bicycle seen behind, with stubbly Bontragers, gives an indication of its size. Extract from Simon’s note on back garden ballistics. Only mod I haven’t worked out how to do is rifle the barrel. Volume of barrel vs chamber is important for efficiency, you want the gas expansion to end by the time the spud leaves the barrel. Too small a chamber and the spud won’t exit, too large and you get a fantastic bang and flames! You need a very short chamber for efficiency but it makes the gun look out of proportion. I ended up using Quick start as a propellent (as long as the aerosol is highly inflammable then that’s good, hairspray works but tends to gunge up the inside with stickiness), also added a burst of oxygen from an aerosol for added power. My barrels were screw fit so had different calibres, got a range of about 300 m, with the largest. Use the strongest 15/16 BAR PVC pipe. Added safety wrap strong gaffa tape around it in case it blows up! (not happened to me). I ended up with a 3 point (6 outlet) piezo electric ignition spark generator attached to 3 sets of 2 gas central heating ignitors. Originally sampled from Spud Blasting.